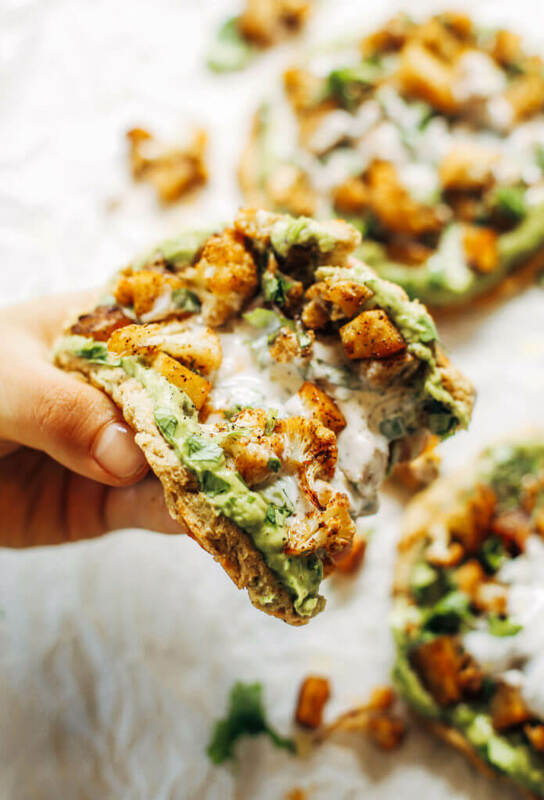 Favorite paleo/whole30 lunch idea: these pitas made with cauliflower, topped with roasted vegetables and the best avocado sauce you’ll ever have! First impressions of these cauliflower pitas: holy moly I need another. Second thought: wait a sec, I can’t… I’m too full. Basically, that’s these pitas in a nutshell! They are so divine and will leave you wanting more and more. At the same time, they are so filling and satisfying. You will feel full and energetic for hours and hours. Power of real food people. YUM! 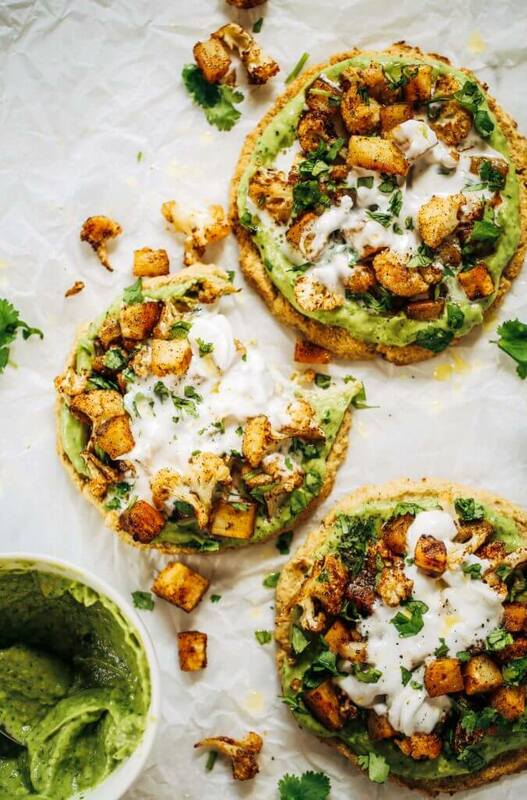 So, you’ve heard of guacamole right? But have you tried this sauce?!! It’s what dreams are made of. I’m not kidding. I’m going to be eating this sauce for weeks and weeks; actually, that’s what I’m doing right now. 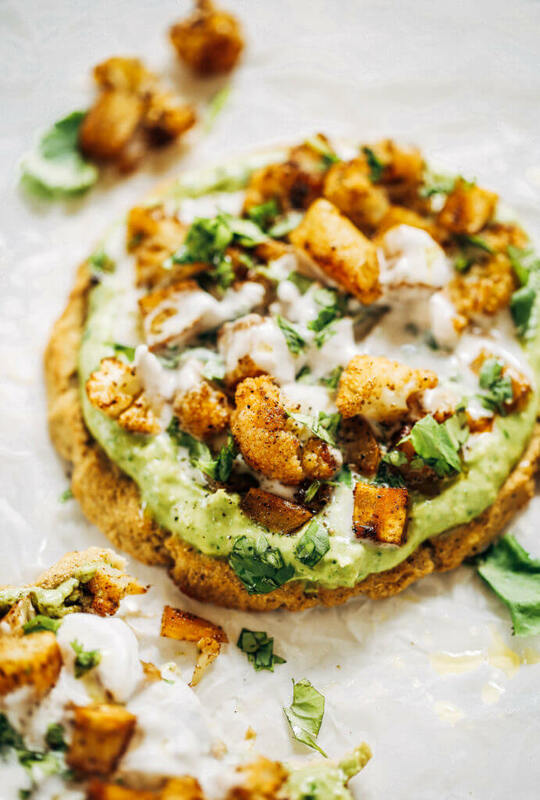 Picture this: the creamiest avocados, a handful of cilantro, a dash of lime juice, a little spice and zing, and a pinch of sea salt. There’s nothing better. It has me eating it by the spoonful. I’m not here for the pitas. I’m here for this sauce! Nahhh, just kidding; I love them both equally. 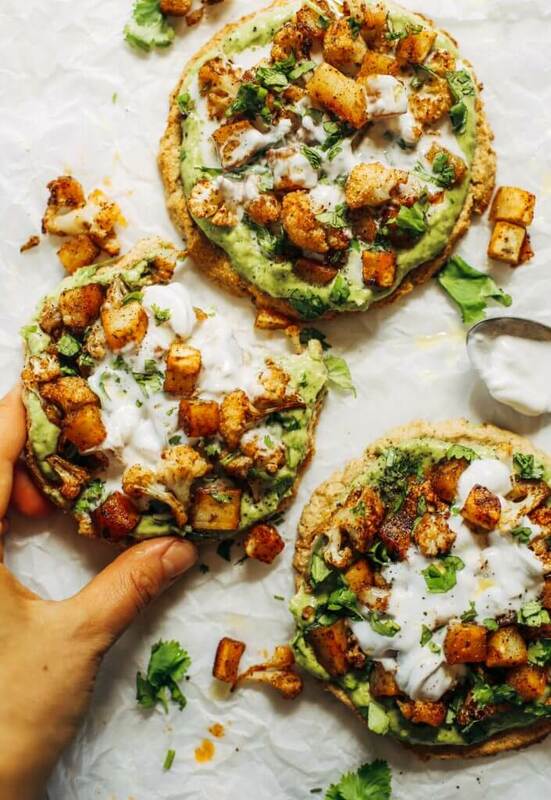 Major props to this girl for the recipe inspo! I saw these pitas on pinterest this week and immediately wanted to make them! … But since I’m not really getting paleo vibes from wheat, beans, and dairy, I decided to put my own spin on this recipe. Thank you Lindsay, for the awesomeness! In my wild attempt to make pitas- minus the flour, I’d say these came out a win. 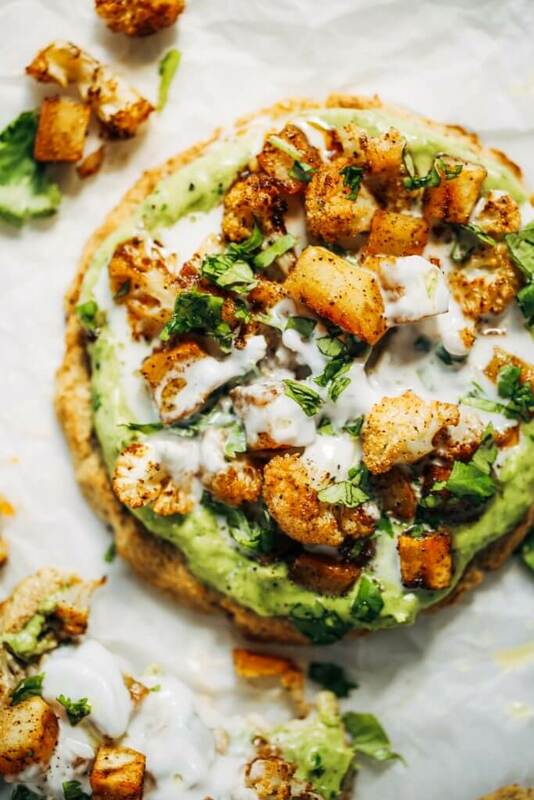 I can’t say they totally resemble the texture of wheat flour pitas, but who’s to say that that’s the goal when you’re using only cauliflower and a few eggs? I’d say it’s a pretty good compromise and it leaves you feeling so fresh, light, and like I said before, completely full. The great thing about this recipe is: the pita is interchangeable! 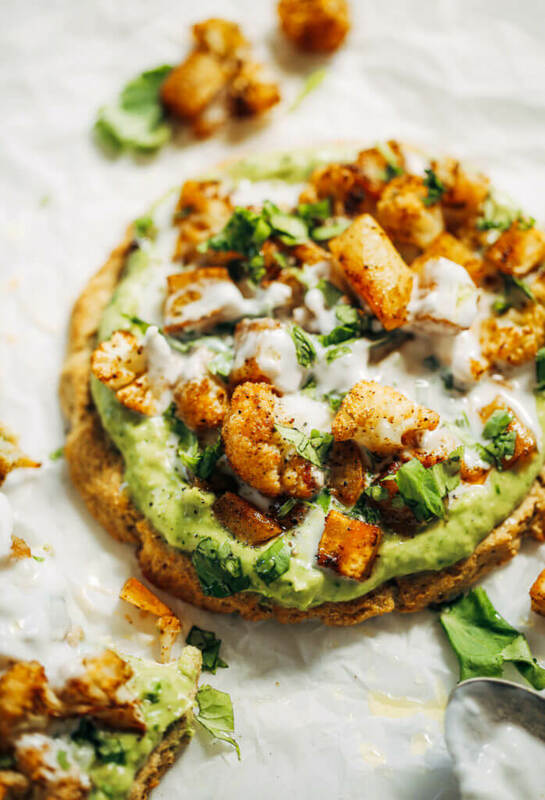 Swap pita for any of the following: my popular cassava flour tortillas or these epic five minute almond flour blender tortillas! If you want to forget the tortilla all around, just lettuce wrap it! No rules. Just awesomeness, this sauce, and the most addictive roasted vegetables. 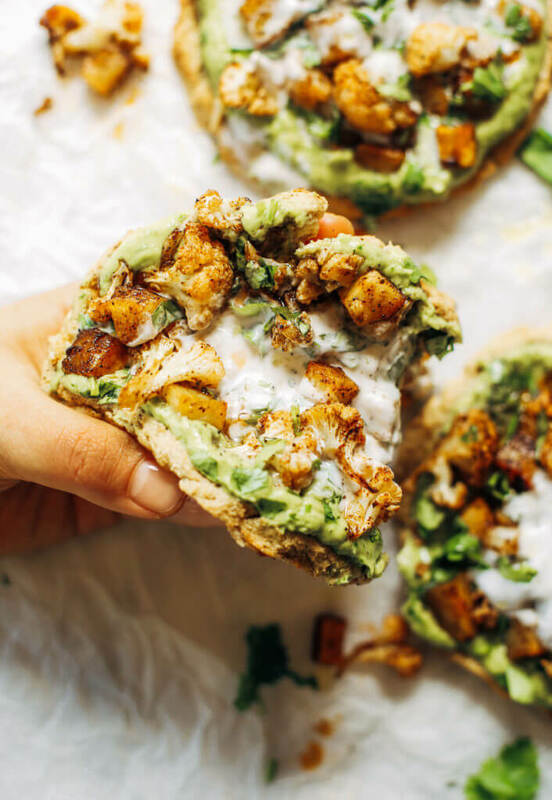 Pretty much, I’m a sucker for anything pitas, avocados, sweet potatoes, and cauliflower. It’s summer time and time to break out those roasted veggies, these denim shorts, time to plant my garden, and definitely roasted-veg-pita o’clock. 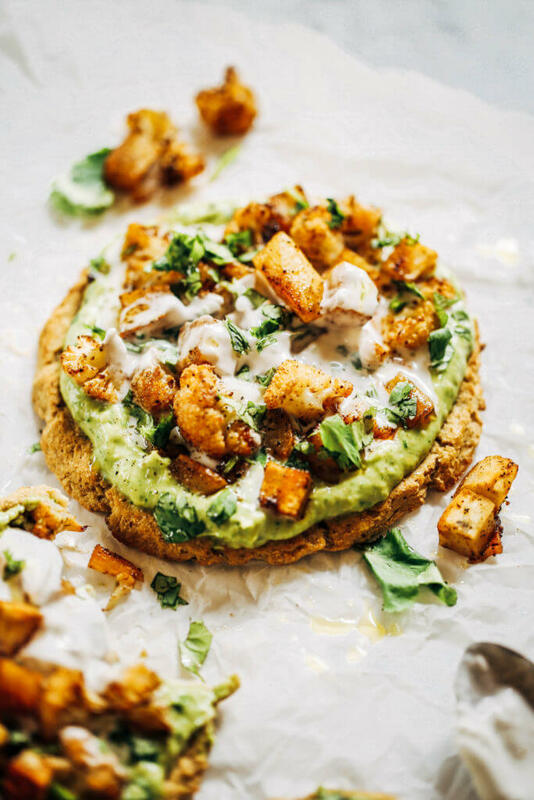 New favorite paleo whole30 lunch idea: these roasted veg cauliflower pitas with avocado crema. 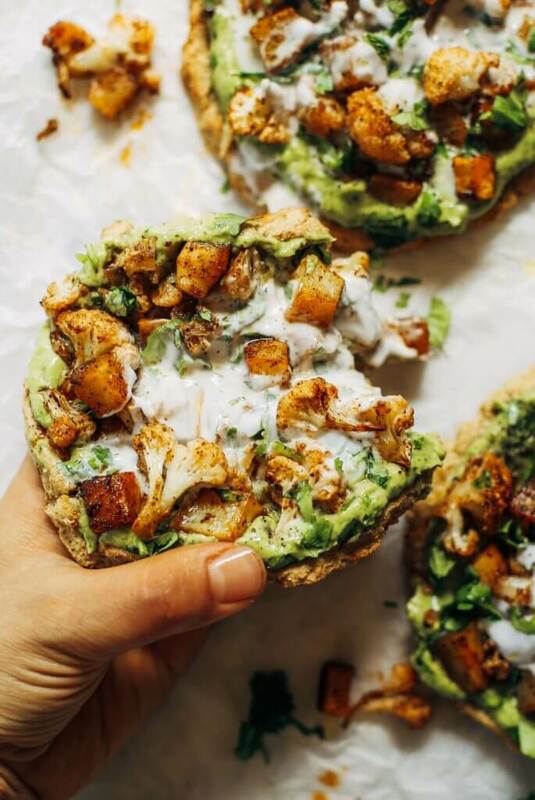 The pitas are made with cauliflower and eggs and taste amazing! 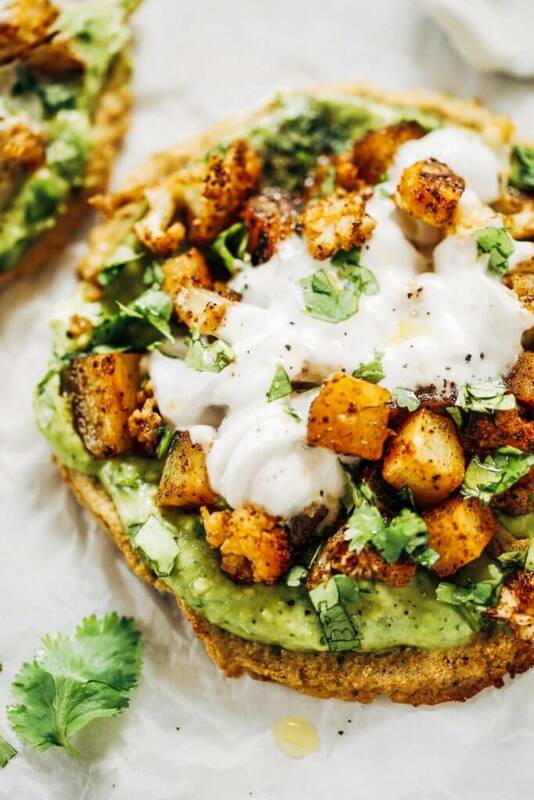 Topped off with roasted vegetables and the best avocado crema that will change your life! Preheat oven to 425F. Line a baking tray with parchment paper. 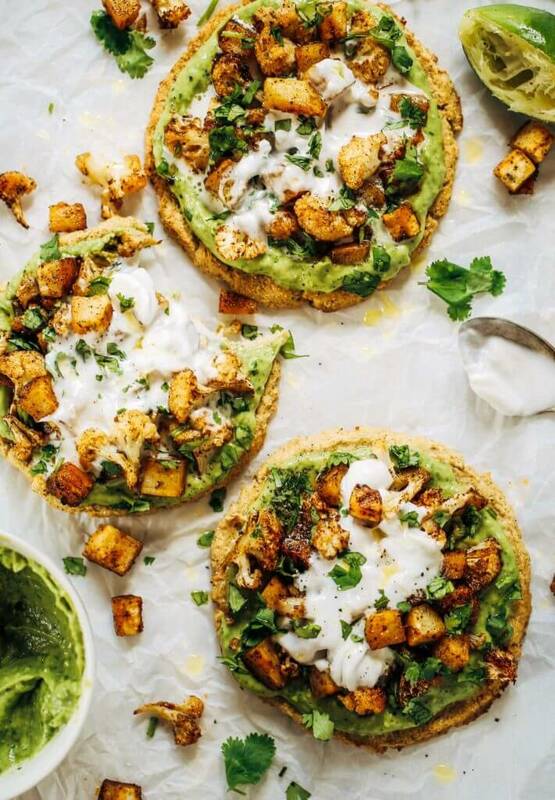 Steam cauliflower rice for five minutes until soft, then drain excess water- put the cauliflower into a colander and press the cauliflower down with a large spatula to really get rid of any water, otherwise tortillas will be soggy. You can also squeeze out the water by wringing it out in a clean dish towel. In a food processor blend cauliflower with rest of ingredients until smooth. Make four equal balls of dough and press down into 1/2" thick pitas. Bake on 425F for 30-40 minutes until golden. After pitas have cooked allow to cool, so they can "solidify". Note: if the pitas are still set inside, pop them in the toaster for a few minutes! Preheat oven to 425F. Line a baking sheet with parchment paper. Dice sweet potato into 1/2" chunks. 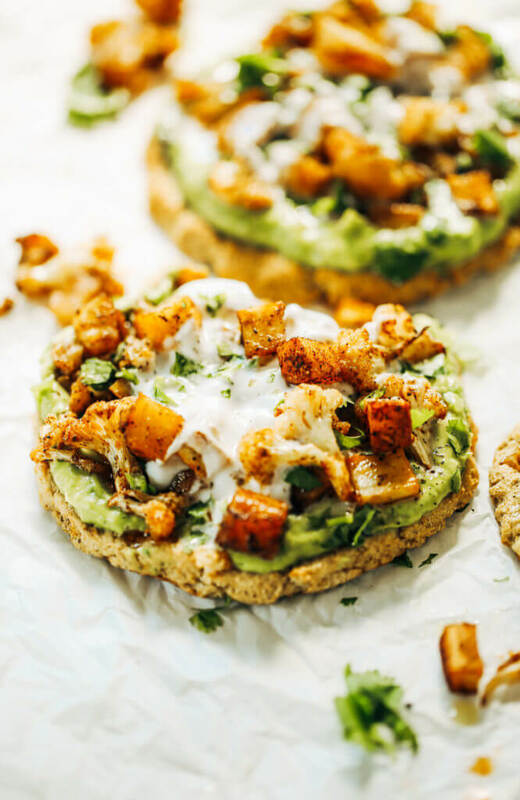 Add sweet potatoes and cauliflower florets on a baking tray lined with parchment paper, drizzle with olive oil, toss with spices, and bake on 425F for 30 minutes. In a food processor or high speed blender combine ingredients for avocado crema until smooth. 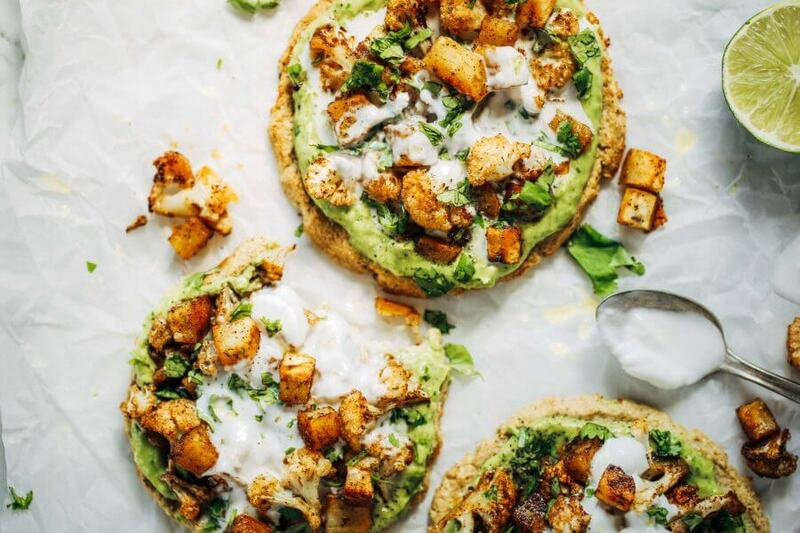 Assemble pitas by layering on avocado crema and roasted vegetables onto cauliflower pitas. Optional: top with cilantro and full fat coconut milk or yogurt. Looks amazing. Hope to try and make this to enjoy our Cavs game tonight or Wednesday! I have a large bag of frozen cauliflower rice from Sam’s club. I’ve yet to use it for anything but am wondering if you think I could use it for this as is, or would I need to thaw it… Looks delish! Made this for dinner tonight…it was AMAZING! Thank you! 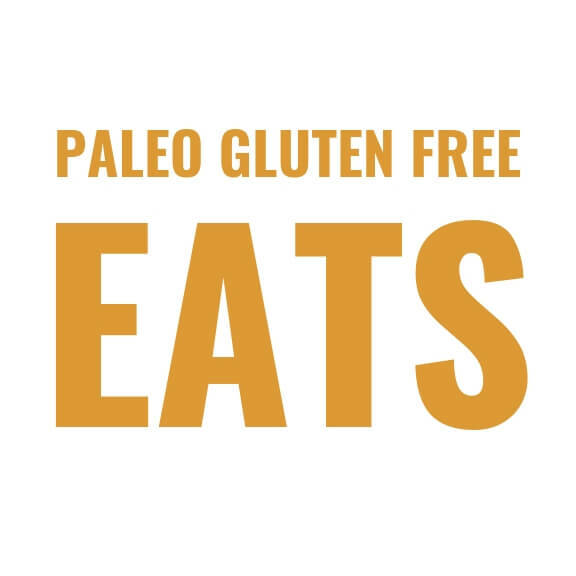 Always looking for paleo-ish vegetarian dishes. Can I replace the eggs with flax eggs? Yay!! Thanks Anna. 🙂 Glad this is working for you. I love this recipe! 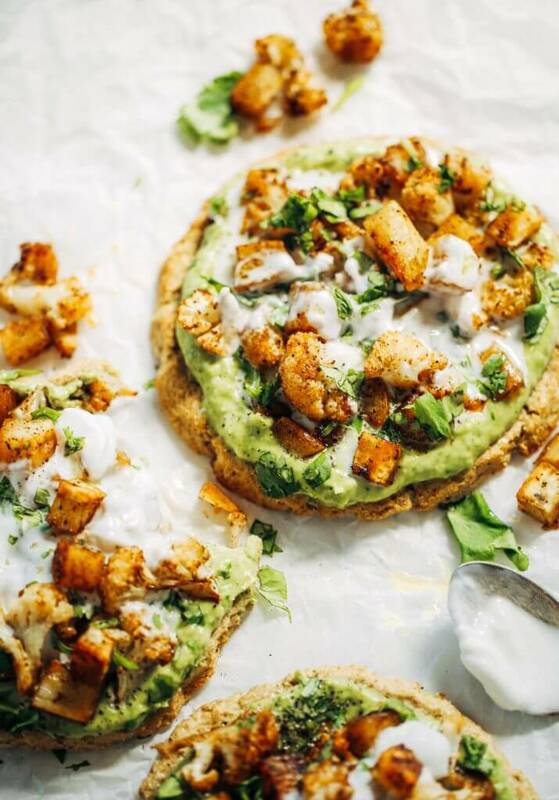 I’ve made it a few times now for different people and its always enjoyed, and SO filling, which is the best part as it really curbs any cravings for after dinner snacks because you’re just so satisfied with all this good, healthy fibre.. One thing I wanted to ask is every time I make it my pitas are quite soft when they come out. I have to scoop them up carefully or they’d flop and the centre is still really soft. Are yours firm and if so how do I get mine like this! I use cauliflower rice thats cooked in the microwave first so I wonder if this could be it? Hi Gemma, thank you so much! 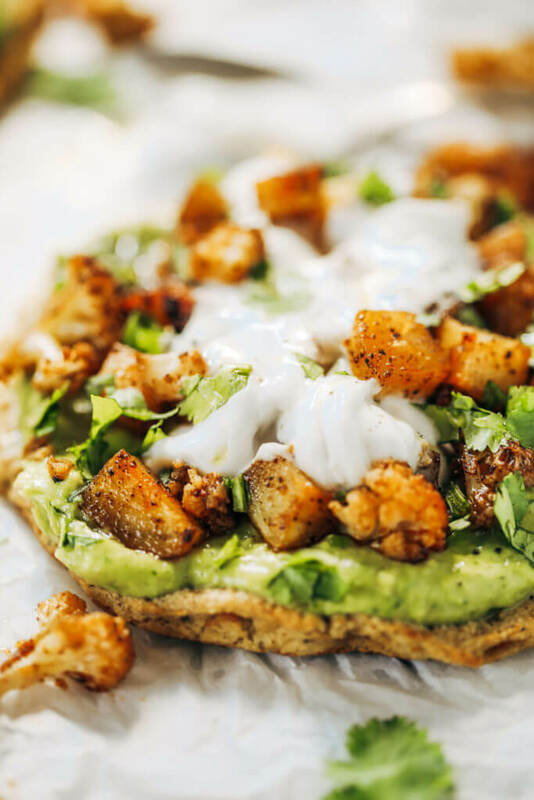 Glad to hear you are enjoying this recipe 🙂 My pitas are also that way, you can add more lfour to make them firmer, but I prefer using more vegetables! 🙂 Hope that helps. Happy cooking! Can you substitute other types of flower other than coconut? I used frozen cauliflower rice and cooked it in a pan for 6-7 minutes to cook out the water. Then, I squeezed it out in a clean dish towel. This process worked well, and my pitas were not soggy at all – they are quite crisp! I would just recommend using 2 whole bags of frozen cauliflower. After I cooked and squeezed it, it reduced greatly, and my pitas were quite small.